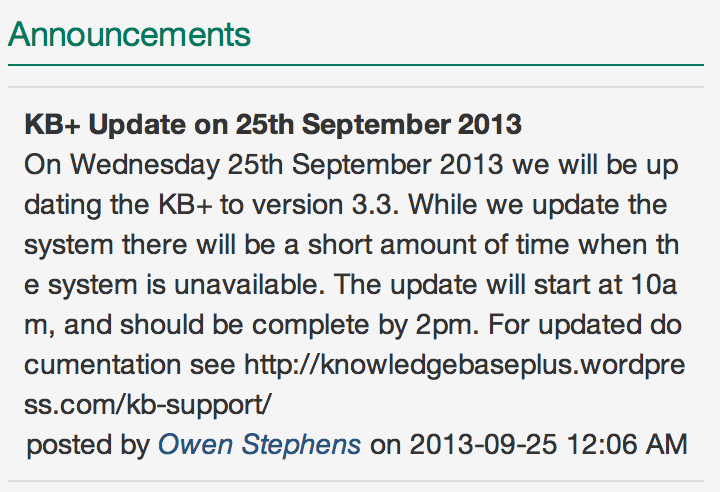 As of KB+ 3.3 (September 2013) there are a range of Communication and Collaboration tools in and around KB+. Automated announcements about changes to packages. These are generated on a daily basis and summarise any changes relevant to a specific package that have been made during the day. Automated announcements are system wide for everyone. Currently the automated announcements track changes at a very granular level, and the KB+ team will be seeking feedback as to whether this is the correct approach. If users feel there are too many announcements or too much information contained in each announcement, then the level of tracking can be amended to give less (or more!) detail. KB+ users cannot make announcements, but can use the Discussions to ask questions or discuss issues. 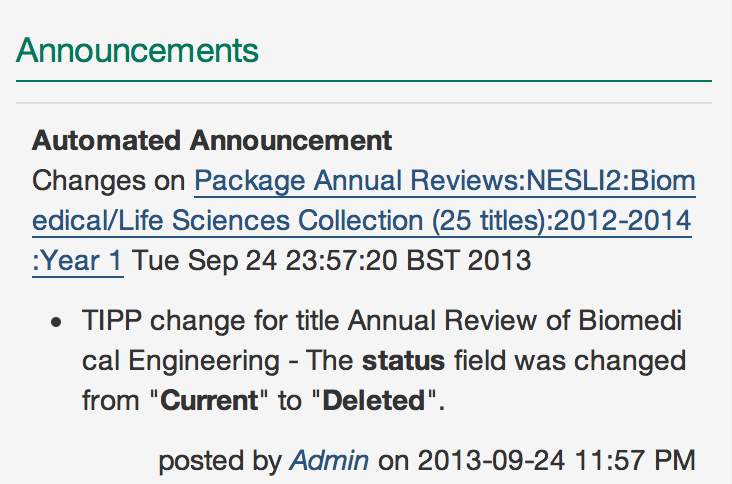 As well as being displayed within KB+ all automated announcements are posted to a Discussion forum – one per package. To track changes to a specific package, you can subscribed to the Discussion forum (via email or RSS) and you will receive and update each time the package is updated. See ‘Discussions’ below for more information. “ToDos” are things that require action on the part of the user (or institution). ToDos are prompts created based on changes in the system that affect institutional licences or subscriptions. 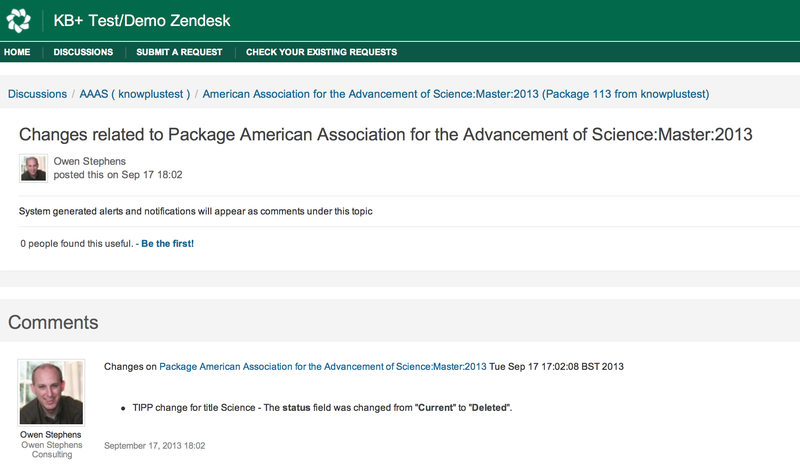 For example, if a journal is removed from a package that is in an institutional subscription, a ToDo will be created prompting for the journal to be removed from the subscription. You can either ‘Accept’ or ‘Reject’ a ToDo. Accepting a ToDo will generally apply the relevant data change to the institution subscription/licence. Rejecting a ToDo will leave the institutional data as it is. Anyone can start a discussion via the KB+ Discussion forums which are hosted at http://kbplus.zendesk.com/home. The most recently created discussions are displayed in the Dashboard for convenience, but to track discussions (by email, by RSS or on the web) please use http://kbplus.zendesk.com/home. As well as user generated discussion, all Automated Announcements get posted to package-specific discussion forums, and if you wish to track changes to packages you can subscribe to the relevant forums by email or by RSS. Users can start a discussion forum on any topic. However the KB+ system also supports a number of automatically created forums – one per package. These can be used to start discussions about a particular package, and are also used to post all announcements from the KB+ system regarding changes to that package. To subscribe by email you will need to be logged into Zendesk. See “Creating a Zendesk login” if you do not have a Zendesk login. Once you have logged in at the top right of each forum thread you will see a ‘Subscribe’ or ‘Unsubscribe’ option – this will dictate if you get email updates when new comments are posted.